HAUNTINGS AND THE HUMAN CONDITION: WHEN GHOSTS MAY NOT BE THE ANSWER BY KEN DE COSTA “I am an agnostic. I do not pretend to know what many ignorant men are sure of.” - Clarence Darrow I have been involved with paranormal investigation a very long time. 40 years (and counting) and if the truth be told I proudly count my very first visit to investigate a reputedly haunted location as Day One so there’s nothing artificial about that hire date. In that time, I’ve witnessed my fair share of events that defy explanation. With apologies to the lead-in for the TV show Ghost Adventures, I too believe there are things in this life that we have not yet fully been able to understand, and I have had more than my share of them. I also concurrently believe that not everything we encounter warrants a paranormally-inspired explanation. Through it all, I’ve always maintained a healthy skepticism about taking any seemingly unusual event strictly at its face value is important because each situation and all data gathered has to pass its own individual “smell” test. Therefore its crucial that alternate and rational reasons for the activity or findings be considered. In doing so, we can begin to ignore the sizzle and focus more on the steak in those instances that truly warrant serious scrutiny and not immediately assign a paranormal value to anything and everything we want to believe has supernatural origins. Most times this is done as a means to validate and justify the time, effort and expense we devote to the cause. To that end, I wanted to address facets of paranormal investigation too often embraced at the expense of logic and real discovery. Far too often, the words “science” and “paranormal” are thrown together as if they are conjoined terms that define a method and approach to the investigative process. This could not be further from the truth. A great many individuals and groups describe what they do using the word “scientific” when in fact, they are practicing anything but science. In doing so, they confuse utilizing “technology” with a scientific approach. There are few among us that do not own a microwave oven, but using one does not make us scientific cooks. The paranormal market is flooded with all manner of gadgetry that is purported to assist in the detection of spirits and their residual signatures like high EMF, cold spots and energy distortions. Most are really of the same ilk and serve similar purposes with similar circuitry save for their varying aesthetic packaging. One may be round and one may be square, one is large and one is pocket-sized, one is gray and the other black. Some detect static while others react to the sudden and temporary absence of visible light, but a gizmo by any other name is still a gizmo. It certainly stands to reason then that in this age of technology, almost all our worldly and otherworldly endeavors will reflect our fascination and dependence on instrumentation, which is never more apparent than the availability of ghost hunting applications for our omnipresent cell phones. With features like flashing lights, chimes and buzzers that illuminate in dark places when the baseline environment is influenced by some manner of outside interference, these apparatus can easily provide the instant gratification and validation that some ghost hunters crave. We do enjoy our toys these days. To be fair, there are some industrious, well-intentioned, intelligent folks who understand circuitry and design who are always contemplating new products to introduce into the paranormal market. Most are variations on the same theme, but a few do show promise and earn points for their creativity and the theories behind their designs even though we don’t really yet know how a spirit might trigger them. On the downside, some of the really interesting and potentially useful devices often come at the cost of at least one of your appendages. Others eventually meet a swift demise when field tests yield nothing substantial and the device is relegated to the equipment case of misfit toys, rarely to be seen -never mind used - again. Using equipment to supplement the investigation process is all well and good and quite often will pay dividends if used correctly and for the actual purpose for which it was designed, but just as often it results in an over-reliance on doohickeys and less on good sense, process and intellect. As a result, they threaten to make one lazy and less enthusiastic about undertaking a thorough analysis of gathered data that might otherwise prove self-defeating and dash hopes for irrefutable evidence of the paranormal. In short, sometimes people just don’t want to hear or see anything that might run contrary to their preferred outcome or belief. Those of us who are not scientists and have neither the temerity or credentials to pretend to be one, need to move past making claims of using a “scientific approach” to investigation. Like so many other statements designed to convey an air of credibility that are uttered on various paranormal TV shows or on social media, being “scientific” became an adopted decree that nobody seems to be in a hurry to back away from. Two commonly-asked questions of all of us here in the salt mines is: “Where do you see the field in 10 years?” and “What can we do to move things forward?” Allow me to re-state my typical standard answer here. It will not be in inventing the ultimate talking machine to the dead or creating the next doodad with lights and buzzers on it. It will be in further understanding the human condition. Why our are brains wired the way they are and what motivates and allows us to perceive and experience strange phenomena? Is it in the classic sense, “all in our heads”? Personally, I find that prospect no less fascinating than something that goes bump in the night.. THE POWER OF SUGGESTION “The subconscious mind is ruled by suggestion. It accepts all suggestions - it does not argue with you - it fulfills your wishes.” - Dr. Joseph Murphy For anyone looking to build a bridge between science and the supernatural, one thing becomes abundantly clear: it is crucial to examine only the best evidence for the existence of the paranormal. The most intriguing cases concern locations where over a period of time, different people claim to have experienced strange events. If this involves individuals who have no relationship with each other outside of these shared experiences, all the better. But one question must be asked in any such situation: Is it the reputation of a location, or the people themselves that serve as the catalyst for the reported activity? One experiment designed to attempt to answer this question was conducted by noted parapsychologist Dr. Richard Wiseman (above) from the University of Hertforshire in the UK. The chosen site of this exercise was the Edinburgh Vaults in Scotland The underground vaults were completed in 1788 and for the next 30 years they housed taverns and tradesman’s workshops as well as being used for storage. Because of the poor design of the South Bridge that was adjacent to the vaults, the water runoff began to flood the vaults which had no means for drainage and by the late 1790s they were eventually abandoned. Later on the vaults became refuge for the homeless and served as host for criminal activities like gambling and illegal whiskey distilleries. It is also said that body snatchers, ghouls who dug up the graves of fresh corpses and sold them on the black market - mainly to medical institutions or rogue doctors for experimentation - stored the corpses there overnight until they could be delivered to their buyers. Since 1997, visitors from all over the world have visited the Edinburgh Vaults in equal parts for its history and its hauntings. While an actual sighting of a ghost there is somewhat unusual, most of the claims concern eerie feelings such as that of being watched or the sensation of being pushed, kicked or touched. It was with this in mind that Dr. Wiseman conducted his test to see how the human mind might play into such things. Because visitors visitors and guides had claimed to have had some odd experiences in various areas of the vaults, it was determined an open-minded investigation be done to determine what, if anything, was really happening there. He brought a staff of researchers in to conduct the experiment and invited 218 members of the general public to participate. After a brief presentation on ghosts and a basic introduction to the format that was to be used, the public was asked to tour the vaults individually for 10 minutes and instructed to write down any strange feelings or experiences they might have and where they occurred in order to hone in on paranormal “hot spots” there. Many claimed they had indeed felt or seen something unusual in certain areas. In fact, around 40% of those participating reported having a strange feeling in specific areas. There were reports of sensing someone standing behind them, footsteps, a burning sensation on the arm and in one case, a man in an apron was seen passing by a doorway. Later on, some of the participants actually complimented the organizers for his appearance thinking it was all a set up to give them a jolt, but neither Dr. Wiseman or his volunteers had any idea what they were talking about. Taking into consideration some of the cells within the vaults have a reputation as being haunted and others do not, reports from participants who were not aware of this were of particular interest. Perhaps not surprisingly, it was noted that those who believed in ghosts claimed more experiences than those who did not, which indicates believers are quite likely more prone to suggestion than non-believers. Also of interest were that more experiences were reported in those areas deemed to be “haunted” than others with no such designation. Lastly, there were some correlations drawn between the number of experiences reported in each cell and certain environmental conditions in each, such as air flow and the overall visual appearance of the vaults. The group was monitored in part by infra-red cameras and EMF meters set up throughout the vaults in an attempt to document any environmental or atmospheric changes. This yielded some interesting results as it was discovered that there was some discrepancy noted in magnetic fields recorded in the allegedly haunted areas as opposed to the areas that were not considered haunted but used for a control test. It has long been maintained that high EMFs can cause a disruption in brain waves and if certain conditions are met, can result in a variety of strange reactions from the subject, including the feeling they are not alone even though the room is totally void of anyone else. EMF AND YOU "Sensitivity to electromagnetic radiation is the emerging health problem of the 21st century. It is imperative health practitioners, governments, schools and parents learn more about it. The human health stakes are significant." - William Rea, MD The effect of EMF (Electromagnetic Field) is something of a controversial subject when it comes to their relation to paranormal activity. Theories abound that EMFs can cause adverse effects on human physiology like nausea, rashes, abnormal cell growth and in extreme cases, hallucination. EMFs are generated by just about anything that is run on electricity in today’s world. Two of the largest sources of EMF are 1.) Transformers, which either increase or decrease voltage depending on power needs. Fluorescent lights for example require more voltage than incandescent lights so they use step up transformers to satisfy the supply needs. Lower voltage needs like those in halogen lighting would require step down transformers. The typical transformer one might see mounted on a telephone pole would also be a step down so it can reduce the power transferred to a home from the direct source, which generates a very high level of EMF. Using an EMF meter near any power lines will confirm this. 2.) An electric powered motor which generates very high levels of EMF. 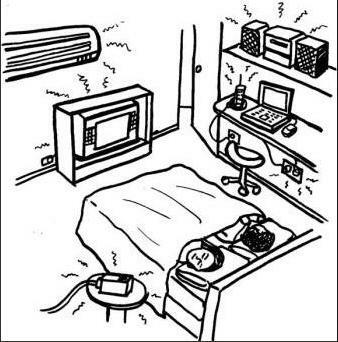 There are any number of simple household products - like an electric razor for example - that can produce an EMF field that may affect someone for a certain amount of time, either subtly or in a more pronounced manner depending on the individual reaction to it. EMFs fall in the category of what are called Extreme Low Frequency or ELF. In North America, anything that works off a power grid and that requires a plug in to an electrical outlet generates ELF of 60 cycles of alternating current (AC). This is obviously the standard measure here in the U.S. but in Europe it is 50 cycles. TVs, stereos, computers, microwave ovens, etc. all generate high frequency EMF. In a 40-year period from 1940 to 1980, a study showed that daily exposure to EMF in industrialized countries has increased by a factor of 100 million times. As a result, we may feel more mentally stressed out today than in decades past because the EMF's that we are constantly exposed to continue to increase in number and strength. Here is something else to consider: Is it possible that our stress levels have risen even higher over the past 30+ years because our total exposure to high level EMF has potentially doubled from 1940 to now 200 million times over that span? Something else to consider: People who plan a vacation often choose secluded areas near lakes, mountains or in forested regions in order to escape the daily crush of people and technology. The typical reasoning in choosing such locations is the opportunity to relax, “get away from it all” and de-stress themselves. For the vast majority of people going this route, they feel much less anxiety and the sense of peace and calm that comes over them is profound. Is it only the combination of beautiful scenery, the absence of constant ambient noise and clean fresh air that triggers these feelings of tranquility, or is the temporary escape from artificially generated radiation bombardments also a strong contributing factor? When our bodies experience a significant amount of magnetic radiation it creates a level of irritability in the limbic region (right side) of our brains. A physical threat to us is then perceived which provokes an adrenal response. It essence, our brains go into a survival mode. On the other side of the coin, studies conducted by the World Health Organization suggest that low-level EMF exposures such as those found in the natural world and normal home environments have not revealed any detrimental effects to the body. From the W.H.O. website: “Reported symptoms include headaches, anxiety, suicide and depression, nausea, fatigue and loss of libido. To date, scientific evidence does not support a link between these symptoms and exposure to electromagnetic fields. At least some of these health problems may be caused by noise or other factors in the environment, or by anxiety related to the presence of new technologies”. So the studies continue. It’s been theorized that when improperly shielded wiring exists in the home or a significant amount of such is present in a more confined area, exposure to high levels can cause some of the symptoms previously noted and in rare cases the result may be misinterpretation of a paranormal event. This type of environment is commonly known to investigators as a “fear cage”. One scientist who put EMF exposure to the test was Dr. Michael Persinger of Laurentian University in Ontario, Canada. Dr. Persinger believes that paranormal experiences can be triggered by outside influences be they man-made, geological or via naturally occurring phenomena. His most noted experiment involved the design and use of a device called “The God Helmet” which was developed by Persinger and a colleague, Stanley Koren. Its purpose was to study the effects of temporal lobe stimulation. The apparatus generates weak magnetic fields that approximate the levels of a land line telephone or hair dryer. The premise is that the left and right side of the human brain work together to create the human “self” with the left side being more dominant. 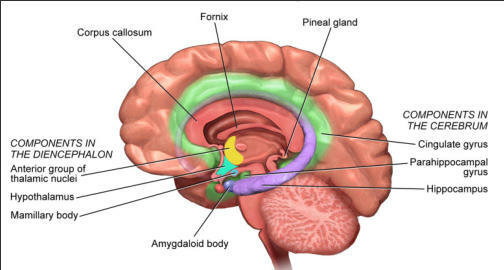 Persinger theorized that these hemispheres can be artificially disrupted and made to function independently of each other so the brain begins to work as two separate “selves” causing the weaker right hemisphere to intrude on the dominant left. Under this condition, he theorized, people can experience the sensation of what can be termed “visitor intrusion” (i.e. ghosts) when the temporal lobe is disrupted. Persinger modified a snowmobile helmet by mounting solenoids on it that were placed over the temporal lobes of a subject seated in an acoustic chamber which also served as a Faraday cage by shielding all outside EMF and radiation. In the first phase of the experiment, the coils are activated in sequence so that only one is active at a time and the pulses rotate counterclockwise over each lobe. In the second phase, both lobes are stimulated simultaneously. Persinger reported that at minimum 80% of the participants experienced the sensation of a physical presence beside them in the otherwise empty room. Some perceived them as angels, a deceased friend or family member and in some cases, a group of unknown beings. One percent reported a religious experience they attributed to the presence of God. It was theorized that individuals are more apt to report a perception or feeling that another person is there to help them cope with a difficult situation. The experiment has met with some skepticism from the scientific community and attempts to replicate the tests have not yielded quite the same results leading to claims that suggestibility had affected his participants. Be that as it may, it does speak to the very real probability that the brain can be affected by man-made external forces and normal functions disrupted to the point where a sort of alternate reality is created. If magnetic fields - applied in a specific sequence - can induce the sensation of a presence in a room, then what conclusion would be reached if the same thing happens to someone in their bedroom in the middle of the night that is not the subject of an experiment and has no knowledge of the potentially detrimental effects of high level radiation? It is not out of the question to assume the initial lack of a reasonable explanation would result in a claim of paranormal activity.